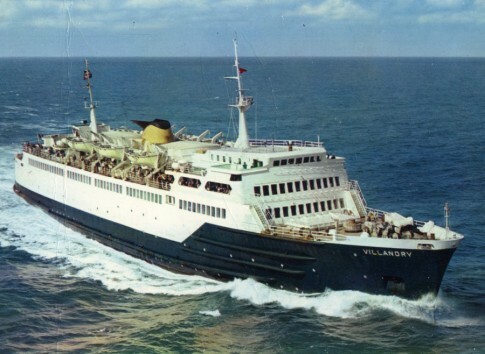 The Villandry is captured on Youtube in the 1960s in these timeless home movie reels – she is seen at Newhaven here and here and at Dieppe here. The ship also makes an appearance in this video which captures some excellent scenes of Britons at leisure in the 1960s but the star of the show is undoubtedly the Falaise, arriving at Newhaven stern-first. Later in her life, the former Villandry is studied in this video at Kefalonia in 1990 and here arriving at Delos. The Villandry and Valencay, as built, joined the Dieppe-Newhaven car ferry pioneer, the Falaise, and that ship’s first season is captured at the start of this Pathe newsreel, which continues past the ferry operation with a consideration of Dieppe and the surrounding area. The former Heysham steamer Duke of Lancaster remains something of an enigma but the dukeoflancaster.net website now has dozens of past and present pictures which help to answer a few of the questions as to what she is like aboard. The Arran steamer the Marchioness of Graham had a notable career, staying close to home through the Second World War and surviving locally until the late 1950s. Later rebuilt in Greek service, this video documents her launch back in 1936. A couple of years ago the former Hovertravel AP1-88 Double-O-Seven found herself in trouble in her new home of Sierra Leone. On a related theme, James’ Hovercraft website has had an overhaul and is worth a look. The hoverport at Boulogne is captured in its heyday in this video from 1982. Trouble for the Tor Anglia in 1976. The famous Danish motorship Jens Bang, which went on to have a lengthy Greek career as the Naias, lives on in this outstanding model by Per Rimmen which came up for auction a couple of years ago. Meanwhile some classic DFDS views of a vintage similar to the Jens Bang can be found here. This significance of this remarkable video, including close-up views of the open bow visor and ramp arrangements of the Wasa King (ex-Viking Sally, later Estonia) arriving at UmeÃ¥ is self-evident. Was Gothenburg the coolest place on Earth in 1973? One would think so from this video – and if, like the folk seen from 10:15 onwards, you could sail in and out on the Stena Jutlandica, Stena Olympica, Prinsessan Christina and Tor Anglia or jet around on those Finnair or KLM DC-9s who can argue? The Stena Nordica of 1965 at Gothenburg. The first Stena Nordica burnt out in Venezuelan service in 1980 but the wreck remains off the island of Cubagua where it is popular with divers. 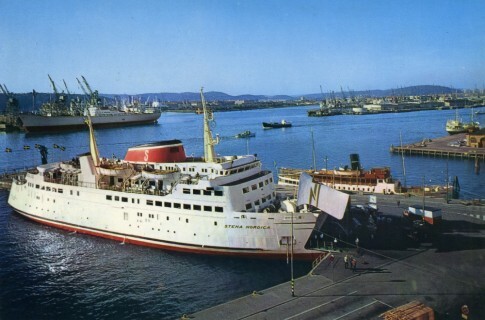 The original Stena bow markings are still visible in this shot. What, meanwhile, has become of the ‘Nordica”s sister, the first Stena Danica? The ship saw lengthy service after 1969 as the Lucy Maud Montgomery in Canada before disposal in 1999. The most recent images I can find of her are as the Lady Caribe I, laid up in Key West in the early 2000s. In late 2007 Shippax reported her sold to “Dominican buyers” but there the trail goes cold. Jadrolinija capers in Drvenik Mali. The ship is the PeljeÅ¡canka, locally-built in 1971 and based on the design of the earlier trio of ships bought by the company from Greece. It is not always plain sailing in Croatia as this rough weather film taken aboard the Ero (ex-Aero) in the late 1960s demontrates. This ship was laid up several years ago and reported sold for scrap in late 2009; however as of May 2011 she still lay amongst the Jadrolinija reserve fleet in Cres. 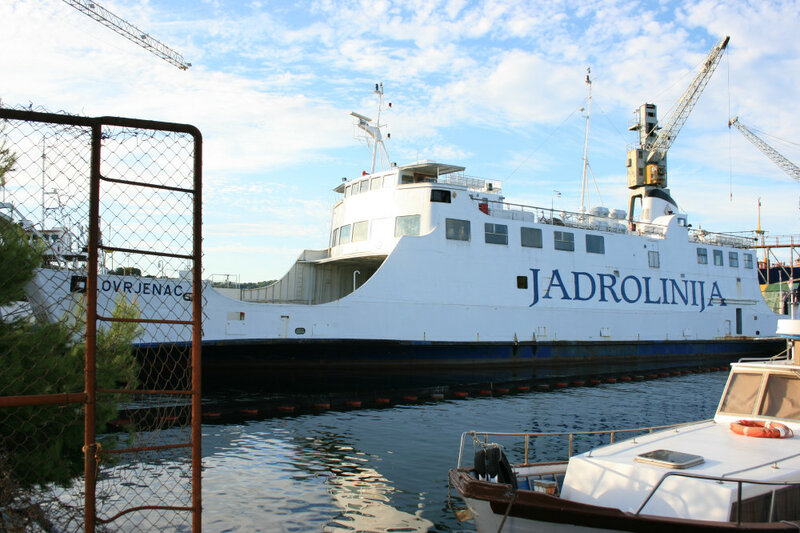 The Lovrjenac seen during her terminal lay up at Mali Losinj in August 2008. The bridge of her similarly retired fleetmate, the Novalja, can be seen to the left. The latest edition of Ferry & Cruise Review includes a picture of the Lovrjenac (ex-Norris Castle) being scrapped at Aliaga, to which she was towed, along with the Novalja (ex-Kalmarsund V) in late May. The Lovrjenac’s Red Funnel and Jadrolinija fleetmate the Nehaj (ex-Cowes Castle) also found her career at an end this year – like the BoÅ¾ava she was scrapped near Venice. With her interlude as a floating bar in Mali Losinj apparently not a success the veteran Marina (ex-Kronprinsessan Ingrid (1936)) has been relocated to Rijeka which will hopefully be better able to support her activities. Although it is hard to establish whether the Middle Eastern operator Namma Lines are still operating, a few months ago the company did post some Youtube guides to two of their ships: the Mawaddah (ex-King Minos) and the Masarrah (ex-St Columba). 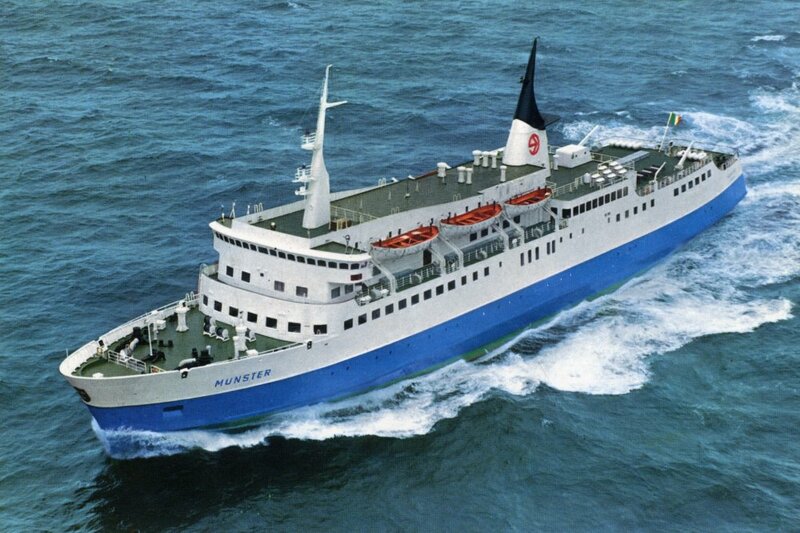 The sister to the Mawaddah, the former N Kazantzakis/Shiretoku Maru is today the Kowloon-based cruise ship Metropolis. ANEK’s Lissos was sent for scrap earlier in the year and her arrival in Alang was captured for the record. The Lissos was an interesting and slightly-awkward looking ship but one I will miss. Certainly the officers of the cargo vessel featured in this near-miss video will not quickly forget her. 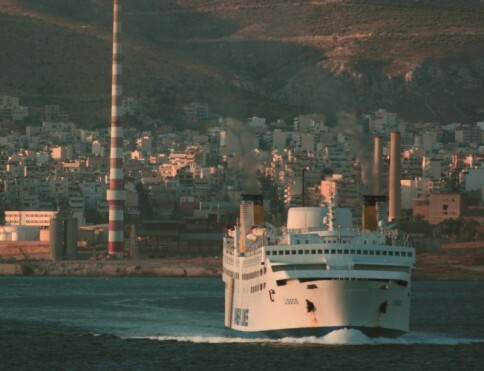 The final demise of the GA Ferries fleet was extensively recorded locally – here is an interesting video taken on board the Daliana just before her departure for the scrapyard whilst the final, slow, death march of the Romilda out of Piraeus can be seen here. Similar videos can also be found showing the final departures of the Daliana, the Marina and the Samothraki. This 1994 video of Chandris’s The Azur (ex-Eagle) transiting the Corinth Canal shows what an exciting part of any voyage on any ship this is for passengers. Crazy drivers in Piraeus are nothing new it seems – various classic passenger ships make cameo appearances in this clip from the movie The Burglars of 1971. The author of the the guidebook Greek Island Hopping, Frewin Poffley, sometimes appears to be lacking in any real understanding of the ferry business but has managed to carve out a niche selling his book to travellers to the Greek islands. 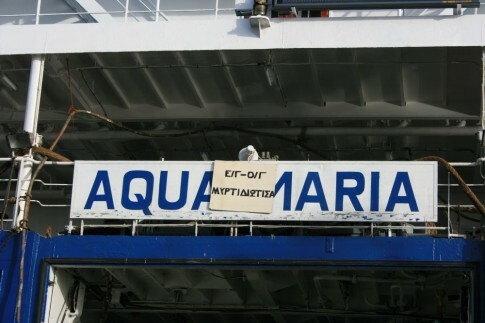 Good luck to him – but repeated requests that he address the unauthorised use of the Aqua Maria image featured here (taken by me on the quayside at Drapetsona on 23 November 2010 and included in this post last year) have met with no response. Poor show old chap. If you are going to plagiarise images from across the internet, then at least there should be the upside of creating a useful resource; this plundered collection of photographs of the Greek Naxos show the ship throughout her Greek career. Another locally-built Greek ship, a few years younger than the Naxos, was the Santorini which subsequently passed to Indian owners, remaining there until apparently being withdrawn earlier this year. The ship is pictured here alongside the former Suilven (now Bharat Seema) in India whilst there are some interal pictures here and an outstanding voyage report here. 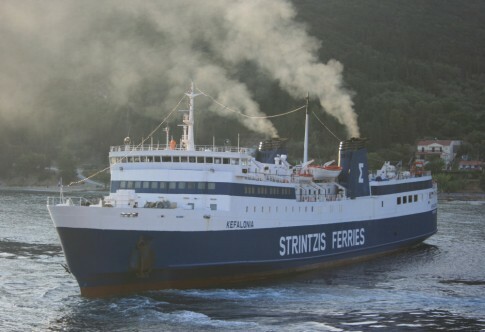 Since the original company was absorbed into Attica several years ago it has been a rare sight to see more than one Strintzis ferry in port at a time. On the occasion that the current pair of ships of the revived Strintzis Ferries switched routes in July, however, it was possible to view the Eptanisos and the Kefalonia side by side. The state of the Greek economy means rumours fly around regarding the futures of several of the ferries owned by operators in that country. Whilst Endeavor Lines earlier in the year strongly denied those concerning their operations, their Ionian Queen has recently appeared as a ‘premium listing’ on the website of a well-known ship broker. 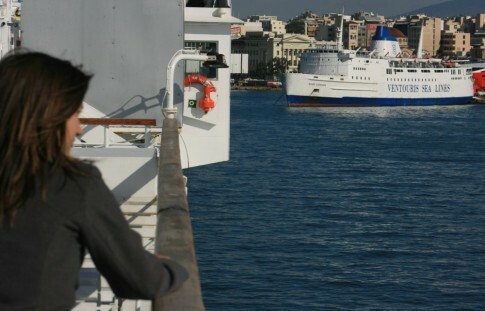 For six years this ships and her sister, the Ionian King, have been the best ships in Southern Adriatic service and the sale of the ‘King’ back to Japanese owners by Agoudimos Lines earlier this year was tempered somewhat by the survival of the ‘Queen’. The departure of both ships would be a sad loss to the ferry operations out of Brindisi and Bari. Endeavor’s other operational ship is the Elli T which one has to think stands a chance of heading to the breakers rather than further service were she to be sold. Leaping back to her original life as the Japanese Okudogo 3, this series of images show what an eccentric but fascinating ferry she was (and to large degree still is) aboard. A ship which sailed from Japan to Greece in 2010 was the 1991-built New Hiyama, purchased by ANENDYK for local Cretan service. The ship, renamed Sfakia I, berthed in the port of Souda (Chania), ostensibly for rebuild, but has remained there ever since – to the intrigue of locals. An interesting video providing a tour of the accommodation has appeared on Youtube.